The house was spotlessly clean with extra linens and bedding easily available. Extra directions to the house were clear and accurate. I will definitely rent this house again in the future. We came, we drank, we conquered. We will be back! We had a wonderful stay and the cabin was very well-stocked with so many things in the kitchen. We also loved that there was a Christmas tree still up when we arrived. It was fabulous! The beds were comfortable and we thoroughly enjoyed the gas fireplaces and hot tub during our stay. We went hiking in Sapphire Valley (Whiteside Mountain), hiking at Devil's Courthouse, hiking around Western Carolina University, hiking on the Deep Creek Trail and saw all the waterfalls there. We went snow-tubing in Maggie Valley at Tube World. We went to the Cherokee museum and went to the Ruby Mine and panned for stones. We had a wonderful New Years Eve and watched the ball drop while soaking in the Hot Tub. We did a ton of hiking - Whiteside Mt, Devil's Courthouse, and Deep Creek Trails with all the waterfalls. We also enjoyed a trip to Maggie Valley for snow tubing. This cabin is very well stocked and we appreciated it greatly. What a wonderful Christmas we had in this absolutely beautiful cabin. I also celebrated my 70th birthday. here with my beautiful daughter. But this trip was also about healing for us as I lost my husband of 43 years in June. We mostly stayed at the cabin and enjoyed our time together, played lots of board games, shot a lot of pool and enjoyed the Hot Tub. We would love to come again! Everyone was Amazing and helpful. The cabin is beautiful and we loved the fireplace. We took the family on the Polar express. We have stayed with GSCR in the past. Absolutely brilliant. Couldn't have asked for better! We'll be back!!! What a wonderful way to spend my 60th birthday! Great gift from my husband. Love the cabin. We'll be back! Cabin and scenery were beautiful. We had a wonderful time and will definitely be coming back! We loved this cabin so much! It was wonderful, nice and quiet! We loved the location of the hot tub and the game room with the pool table. We went fishing, shopping and eating!! Fun family vacation! Great place to relax. My brother in law and myself. We lost our wives with in the last 2 months to Cancer. We had to go somewhere to get our minds off of it and spread their ashes in the Smokies where they loved it Thank you so much! Wonderful cabin with great views. Guest manual very helpful. Courtesy call to see that we had arrived was a very nice personal touch. Everything, including the staff was first class. Celebrated my birthday - had a wonderful time. Enjoyed nature and all the features of the cabin. God Bless and warm regards. We loved that the cabin is so close to Harrahs and everything we wanted to do. It has beautiful views! The team at GSCR was excellent to work with! As returning guests we always marvel in the surrounding areas. Our favorite place to visit is the Smoky Mountains. Mingo Falls is a must every time we visit. Making memories with our childrens while visiting this area has become a yearly tradition. We will be back again soon! We would like to express our enormous satisfaction for your excellent service received during our winter vacation. This cabin is beautiful and was beyond our expectations! 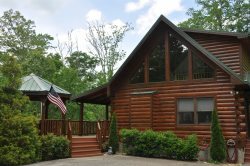 We really appreciated everything, the cabin was very clean, the area is so peaceful, the location is so convenient and the customer service is the best ever. Came for our Honeymoon and loved every minute of it! The house is beautiful and the location is great. Will definitely be back soon! Highly recommend the Helicopter Ride! The cabin was above and beyond our expectations! We came for a Birthday vacation and loved the deck. We went hiking, enjoyed downtown Bryson City and the Cherokee Indian Village. The cabin is big and sunny. We had a family reunion here and enjoyed the big decks, the hot tub and pool table. What an awesome place to call home for a week of nothing but fun! Everything is so close at hand - beautiful scenery, casino, food and attractions. (Granny's kitchen is a must!) Beautiful moon thru the upstairs bedroom window - so wonderful and relaxing yo never want to leave. Another trip will be planned...next year, same time, same cabin!! We loved it all!